This picture is taken from the middle of the village looking up The Dale towards Eyam, with Lovers Leap in the distance and the Toll house immediately behind the photographer. 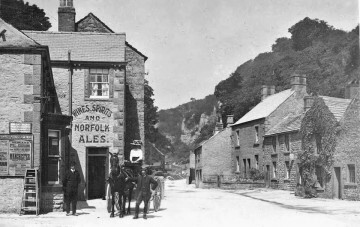 The pub was open until the mid 1900’s when it closed following a fire. The house on the right which stands proud of the others was knocked down to allow the road to be widened, and is now used for resident parking. The billboard on the left has the name Midland Railway on it, it seems to advertising some event or trip to Manchester and therefore must have been the stopping place for the coach service (presumably horse and carriage). The sign on the wall of the cottage on the right verifies that it was a shop which was known to be there in the mid 1900’s as a general store. The lady on the trap is presumably well off and perhaps out socialising.